A dark ruby stout with powerful aroma of whisky, alcohol, treacle, and hints of resiny hops and fresh woodiness. A strong initial hint of vanilla gives way to cherries, cream, and chocolate with a satisfying, drying earthiness toward the finish. When I heard a liquor store here in Indy had a bottle of Tokyo*, I just had to have it. This beer is VERY limited, and very strong. I called the liquor store, and they didn’t know if they had any left. I went in… and they had 6 bottles for $14.99. That i insanely cheap for this beer. They only made 3,000 bottles of this stuff. I should have bought two so I could cellar one. You can hold on to this puppy for up to a decade. I am a big fan of BrewDog. They have a very Three Floyds brand to them, and they are always trying to push the limits with their beers to produce a bigger and better brew. I am pumped about this one. I hear it smells and tastes like a fine whisky… sign me up! In the Glass: This beer has a very impressive tan head on it. The lace is also amazing. It just hangs on for dear life. I assumed that a beer that is this big would have a thicker appearance, but I am glad that it doesn’t. I also didn’t smell anything as I was pouring, so I am excited to stick my nose in the glass. Nose: Now that smells like a stout. This is an imperial stout, but there are tons of cranberry notes rushing to the surface. You also get the booze, which I expected. I hate it that I keep going back to the ABV, but man… this is big. I am sure the beer, because of BrewDog, will impress. But that number is hard to ignore. Flavor: The flavor is immediate on the tongue. As you swallow it becomes somewhat sweet, and then you are hit with the heat of the alcohol. It is not overwhelming, and deepening on the setting could be quite welcoming. I would compare this to a good barleywine. I will say I disagree with people who compare this to whiskey. Not even close. Mouthfeel: The mouthfeel is incredible. The bubbles are enough to appreciate it, but then the sweet smoothness sets in. It feels thicker on the tongue than it looks in the glass. I am very impressed with the overall complexity of this beer. Aftertaste: Awesome. The aftertaste is incredible. It is sweet, and just hangs on begging for another drink. The chocolate is also present when it comes to the aftertaste. It is a deep, dark chocolate note that hangs on after the sweetness becomes slightly bitter. BrewDog, you have done it again. I am blown away with this beer, and am SO glad I got to try it. I might see if I can find another bottle and throw in the cellar. Imagine 10 years from now… If you like a good beer that provides a mouthful of flavor and will leave you drunk after 1 or 2 pints, then grab some BrewDog. I will warn you, this is NOT a beer for someone that isn’t into craft beer. Bottoms up, people! 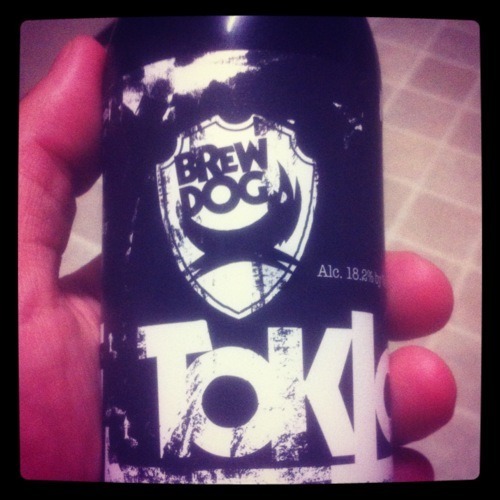 Tokyo* – The bottle says: “This is a beer inspired by a 1980’s space invader arcade game playing in Japan’s capital. The irony of existentialism, the parody of being and the inherent contradictions of post-modernism, all so delicately conveyed by the blocky, pixelated arcade action have all been painstakingly recreated in this bottle’s contents. This imperial stout is brewed with copious amounts of specialty malts, jasmine and cranberries. After fermentation we then dry-hop this killer stout with a bucketload of our favorite hops before carefully aging the beer on French toasted oak chips. Tonight’s beer is a special one. It is beer number 100! It’s a pretty potent one, too. This beer is over 18% alcohol. That’s pretty high, considering most beers are only 5%. The brewery it is from has a reputation for trying to make some of the beers out there with the highest alcohol content. The beer smells really good. It actually reminds me a bit of the Bourbon County Coffee Stout from Goose Island. I hope it comes even close to tasting as good. The beer smells… boozy. Is that bourbon? Whatever it is, I like it. It also has a bit of a malty smell to it as well. It’s very dark, almost black, and somewhat thick. There’s not much head, just a little bit of tan foam at the top. I’m excited to see how it tastes. Wow. This is a fantastic beer. Malty, sweet, syrupy, and boozy. And definitely a lot of heat at the end. It packs a punch that lasts quite a while after you swallow. This beer reminds me a lot of the good, intense beers that I’ve had lately… Bourbon County Coffee Stout, Dark Lord… it’s in the same league as those, in my opinion. And it’s just as alcohol-heavy. I can already feel it after only a couple of sips. This beer is hard to describe. Other than the tastes I’ve mentioned, it almost tastes a little bit carbonated, but it’s really not. It’s just very powerful. So much flavor. This is one that you just have to experience to really understand. If you can find a bottle of it, get it! It’s pretty rare and won’t be made again, apparently. Glad I got the chance to experience it. Definitely a good one. Light, effervescent flavors dance on the tongue and refresh both the body and soul. The clean finish leaves a tingly fruit sensation. Lovely paired with salads, seafood and spice dishes.